"Personalized Mother's Ring in 14K Gold, Double Intertwined Ring for One Child"
Our most popular rings now available in 14K gold. This ring will be an heirloom for generations to come. 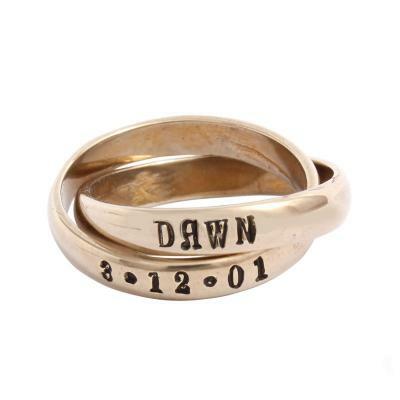 You can have this unique mother's ring customized with names, dates, words ~ use your imagination. For the mother of one put the name on one band and the birthdate or meaningful word on the second band. Personalized mother's name rings now in gold! Buy it for the mother of one and put a name on one band and the birth date on the second band. Or put a nickname or meaningful word on the second band. The overlapping custom stamped bands create a beautiful ring which is subtle and meaningful. When determining your size, we ask that you give us a size that is a snug but comfortable fit. If you are unsure of your size, you can order a ring and select the option for ring sizer from the dropdown and we will send you a ring sizer and instructions on how to send us your size.